November: we’re rushing towards Christmas now, and this is the time that I often get asked for advice on buying a telescope because X is interested in astronomy and we’d like to buy him (it’s always a him) one for a present. What I would really like to say (but never do) is that a telescope is the last thing you should buy him, literally. Space is big (where have I heard that before?) and it is more fun and really useful to get to know it fairly well before pointing one of the many excellent scopes now available at it. To this end, I would recommend a subscription to a good astronomy magazine, preferably one with a British base (the biggest seller is based in the USA). There are many good books and guides available but magazines have the feedback of readers’ queries, together with up to date news – and my personal favourite is especially novice friendly. A good pair of binoculars is also an excellent first purchase, but for night-time use they need to have big lenses. I would recommend 10x50 – that is a magnification of 10 with a lens size of 50mm. Try them out to make sure they are free from any “double vision”, blurring, or coloured edges to objects near the edge when viewing in daylight. In use, rest your elbows on a table or fencepost or lean against something to keep them as steady as possible and the night sky will become a fascinating world. 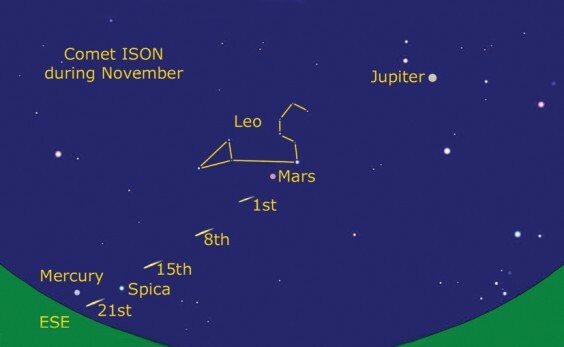 In our skies, Jupiter still dominates the early evening but is now setting earlier and is gone by ten o’clock at night. Its four largest moons are easily visible through binoculars. On the 23rd, Jupiter and a thin crescent Moon will be very close together, making a wonderful sight – but they will be too low to see by eight-thirty, so get out and look as soon as it gets dark. Full Moon is on the 2nd and also on the 2nd of December. At this time of year, the full Moon really floods the sky with light and drowns out almost everything else. The big constellation of Pegasus, or at least the Great Square, is very obvious in the south. Looking above it and slightly to the east, there is the wonky W of Cassiopeia. This little constellation sits in the Milky Way and also on the opposite side of the sky to the Plough. Below Cassiopeia, two lines of stars stretch out from the top of Pegasus, looking like his back legs but, in fact, they have been declared to be the separate constellation of Andromeda. Lower still is the vee of Pisces, the two arms embracing the bottom left corner of Pegasus. None of the stars of Pisces are very bright so you will need a good clear night to make it out. The 12th should see the launch of the Space Shuttle Atlantis. Keep your eye on http://www.heavens-above.com to see if it’s visible, as there are only about six shuttle launches left and none of the other Space Station delivery vehicles are anywhere near as bright.